Here’s an apple spice cake that showcases the flavors and smells of Christmas. This three-layer extravaganza has a touch of molasses and shredded apple to keep it moist. As the cake bakes, it fills the house with a fragrance that beats the most expensive holiday-scented candle. 1. Place one oven rack in the bottom third of the oven and a second rack in the top third of the oven. Preheat the oven to 350°F (175°C). Grease three 9-inch cake pans with butter or cooking spray, then line each with a parchment paper round and grease the rounds. 2. Using an electric mixer fitted with the paddle attachment, cream the butter and sugar on medium-high speed until light and fluffy, about 3 minutes. Scrape down the sides of the bowl with a rubber spatula. Beat in the molasses. Add the eggs, one at a time, beating between each addition. In a medium bowl, stir together the flour, baking soda, salt, and ground spices to blend. Add the flour mixture and sour cream alternately to the batter. (Start and end with the flour mixture, adding the flour mixture in 3 increments and the sour cream in 2 increments.) After each addition, mix on low speed just to combine the ingredients. Stir in the shredded apples, vanilla, and the ginger, if using. 3. Spoon the batter (it will be thick) evenly into the prepared pans. Place two cake pans side by side on one rack and the third on the other. Stagger the cake layers on the oven racks so that no layer is directly over another. Bake for 35 to 40 minutes, until firm to the touch. Monitor the layers carefully for doneness; each one may be done at a different time. Remove from the oven and let cool in the pans for 10 minutes. Run a knife around the edges of the pans and unmold the cakes onto wire racks to cool completely, 15 to 30 minutes, before frosting. 4. The cakes can be kept frozen, tightly wrapped in plastic wrap, for up to 3 weeks. Defrost them at room temperature before unwrapping. Frost immediately. 6. While the caramel is cooling, make the buttercream: Using an electric mixer fitted with the paddle attachment, beat the 1 1/2 cups butter on medium-high speed for about 1 minute, until pale in color. Add the remaining 2 tablespoons cream, and the vanilla and powdered sugar, and beat for 3 minutes, until light and fluffy. Add the mascarpone and beat on medium-low speed until incorporated. Do not overbeat the mascarpone or it may separate. Reserve 1/4 cup of the cooled caramel mixture to drizzle over the cake once it is frosted. Stir the remainder of the caramel into the frosting, using large strokes to create caramel swirls throughout. Don’t stir it too much or the ribbons of caramel will disappear. 7. 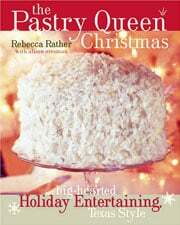 Place one cake layer on a serving plate and spread a thick blanket of frosting on top. Add the second layer and spread thickly with frosting. Add the third layer and cover the top and sides of the cake with an even layer of frosting. 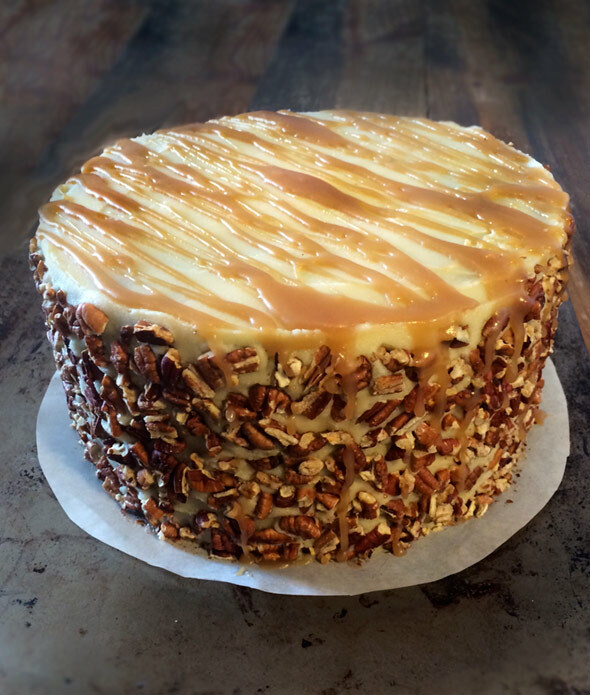 Use a small spoon to drizzle the reserved 1/4 cup of caramel over the top of the cake. Pat on the toasted pecan pieces, if using, to cover the sides of the cake. Using the proper tools for cutting frosted layer cakes ensures that individual servings look as good as they taste. I use a large serrated knife, dipped in hot water, for cutting. I wipe the knife off with a clean dishcloth after each piece, which ensures that every cut is as clean as the first. Apple Spice Cake with Caramel Sauce Recipe © 2007 Rebecca Rather and Alison Oresman. Photo © 2015 home baker and LC reader Marta Pérez Morguí. All rights reserved. All recipes and photos used with permission of the publisher. Absolute success. First try ever on a layered cake, I took a chance for my cousin’s birthday and it turned to be the perfect dessert! 2. The only thing I changed was the caramel: Instead of using unwrapped caramels I just made a small batch of salted caramel with sugar, butter and cream. It provided the cake with another level, the saltiness balanced really well with the other components. I didn’t only mix some caramel with the frosting but I also drizzled it on top of each frosting layer. 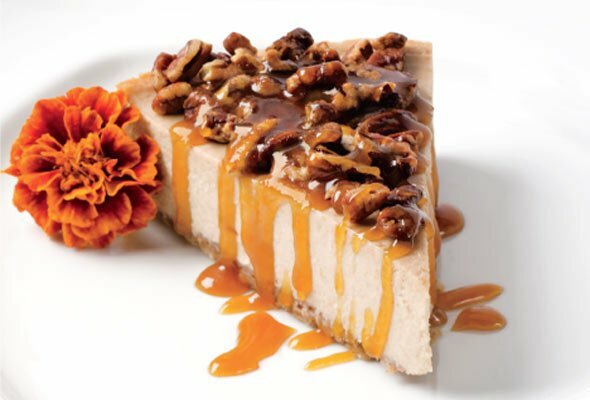 Caramel is never too much! 3. To anyone considering baking this cake: DO IT! It is really worth and doing it in separate days is not a problem, it turns out gorgeous and delicious anyways! Just remember the caramel must cool down before using it with the frosting, and if you want to speed the cooling it will crystallize. So give yourself enough time for it! Thank you again for your wonderful recipes. You guys are always my go-to site when looking for desserts. Never disappointed!! Wow thank you so, so much!! It is a real honor!! No, thank you! It’s a stunning photo.